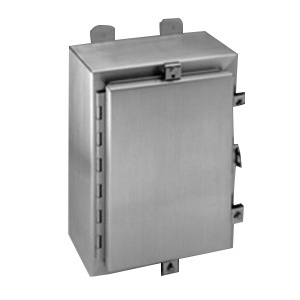 B-Line One door hinged cover panel enclosure is ideal for protecting electrical controls and instruments. This enclosure measuring 20-Inch x 16-Inch x 6-Inch, features smooth finished continuous welded seams. The enclosure features a door that has padlock hasp and sealing hole provision. This enclosure comes with a printed pocket. It features ground stud in the body and it forms lip around the opening to prevent liquid and contaminants. Enclosure has external mounting feet for safe wall mounting. The enclosure is ideal for indoor or outdoor applications. The enclosure meets UL, cUL and NEMA standards.